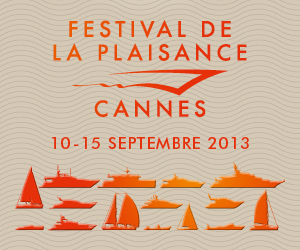 The Festival de la Plaisance de Cannes, the most prestigious afloat boat show in Europe with trials at sea, will hold its 36th edition in the Bay of Cannes from September 10 to 15, 2013. The Vieux Port and Port Canto will welcome more than 500 boats designed by major shipyards, including 100 world premieres and art of living on board will whowcase in the Espace Riviera at the Palais des Festivals. 450 exhibitors from 34 countries will present their innovations on 250,000 m² to some 46,000 expected visitors. The Festival de la Plaisance de Cannes is renowned for being an international venue in which many units are presented in world premiere. Enthusiasts can discover, among other innovations, the following units: Absolute 64 Fly, AmerCento, Aureus Xv Absolute, Baglietto 44 Fast, Cerri 102, Couach’s 2600 Fly, Cranchi Trawler 5o Long, CNB 76, Delher 38, the Ferretti F960, Fountaine Pajot Cumberland 47 LC, Mangusta 94, MCY 86, Princess 98 MY, Wauquiez – Centurion 57. The largest units by leaders of the international marine industry, including boats from 15 to 50 meters, will be exposed Quais Albert Edouard North & South and at the Super Yachts Extension. A range of 10 to 25 meters boats afloat will be displaed on the piers of La Pantiero, the Quai Saint-Pierre and Quai Max Laubeuf, including traditional yachts, sailboats, powerboats, open boats or fly, sport fishing… More than 40 sail or motor multihulls will make the “Espace Multicoques” the world’s largest exhibition of two or three hulls boats. This year, the boating equipment will be merged into a new “Village des Equipements”, located in the heart of the Pantiero and Old Port. A Tender space will occupy a full extent, on the ground by the sandy beach, from the main entrance to the Quais Albert Edouard South and North roundabout. To allow testing, tenders will also be present on the Traversante connecting the two main piers of the port. The Espace Riviera will host several shipyards, services companies (finance and insurance), equipment for high-end units, and also marinas. The VIP Club and restaurant will welcome guests on the first floor of the Espace Riviera, offering them a panoramic view of the Festival de la Plaisance de Cannes and the most beautiful units afloat. The “Brokerage & Charter Area” located in Port Pierre Canto will bring together the world’s largest brokers – including Ardell Yacht & Ship brokers, Blue Water – Camper & Nicholsons International Dbeere-Yachts – Dubois Yachts Ltd – International Yacht Register – MSC Yachting – Ocean Independence – Oceanstyle by Burgess – Rodriguez Group. Fifty second-hand boats from 23 to 50 meters will be presented by brokers alongside luxury tenders. This year, Sylvie Ernoult, the new Show Manager with thirty years of experience in the marine and tourism industry, took over the development and strategy of the Festival de la Plaisance de Cannes.